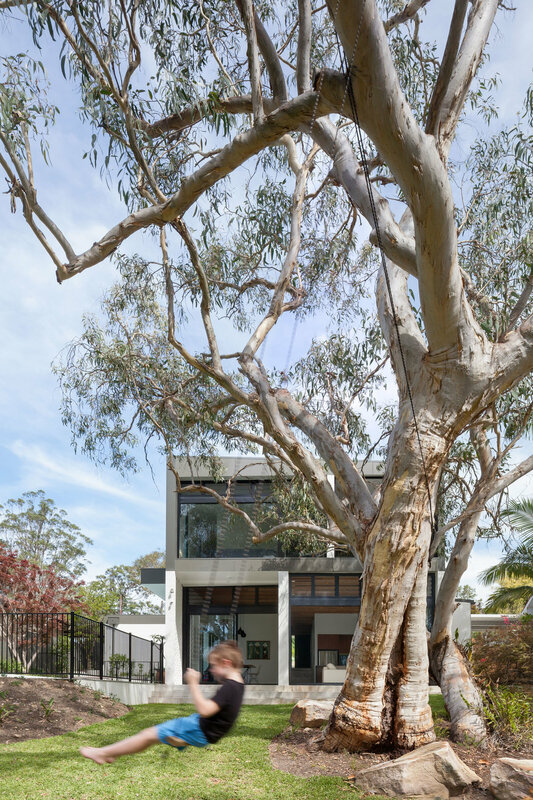 A new family home located on Sydney’s leafy North Shore, nestles into a sloping north-facing site with a dramatic garden aspect onto a natural bushland reserve. Three large Scribbly Gums dominate the site - generating the design strategy by way of site layout, structural expression and colour palette. The material palette is raw and robust offering a casual and durable environment for an active family life whilst embracing the owner’s wish to participate in the creation of their family home. The interiors are a mix of exposed concrete, natural timber and both painted steel and plasterboard, which are low maintenance to suit the young family’s lifestyle. Externally, painted brick veneer construction offers an economical nod to the suburban context whilst the upper storey cladding utilises a raised seam roof sheeting to meet stringent Bushfire requirements whilst offering a play of texture and shadow. Colours and structural expression are inspired by the natural tones and texture of the Scribbly Gums.